The coffee scrub giving old grounds new life.Scrub up fresh after a night out. 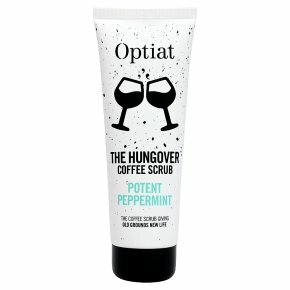 A blend of used Arabica coffee grounds and peppermint essential oils, our Potent Peppermint revives your skin and perks up your mood after a night on the town. Squeeze out a dollop of Potent Peppermint, scrub into damp skin in circles and leave for five minutes. Rinse well and revive yourself for the day ahead. CAUTION: Shake well before use. Patch test first, at least 24 hours before using. Do not eat. In case of eye contact, rinse thoroughly. If irritation persists, seek medical advice. For external use only. Keep out of reach of children and direct sunlight. Scrub may separate when it gets too hot. Cool down to emulsify.